ST. LOUIS -- The St. Louis Blues are sticking with goalie Jake Allen in Game 5 of the Western Conference final against the San Jose Sharks. It's not a huge surprise considering how well the Blues played after the goalie switch. They're coming off perhaps their best game of the postseason, a convincing 6-3 victory that knotted the series at two games heading into Monday night's game. Coach Ken Hitchcock switched to Allen to give the team a "jolt" because it was becoming overly reliant on Brian Elliott. He didn't care if it was viewed as a goalie controversy. "We needed to play harder for a goalie," Hitchcock said. "It didn't matter if it was Ells or Jake or whatever." Hitchcock kept quiet about other potential roster issues, saying he'd have updates on captain David Backes and rookie Robby Fabbri on game day. Both have been major reasons the Blues are in their first conference final since 2001, Fabbri with 14 points and Backes with seven goals and 13 points. 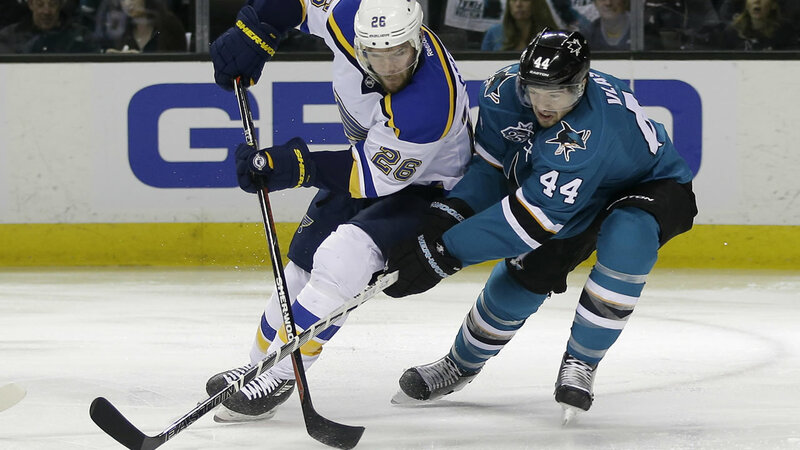 Sharks coach Peter DeBoer expects a bounce-back effort in Game 5 without making lineup changes. "You know what, we've played some really good hockey in the last two or three weeks," DeBoer said. "I think we can fix it without having to take those type of measures." But DeBoer added he'd "sleep on it." Allen and Elliott basically split duties during the regular season, each playing long stretches because the other was injured. Allen was ready when the call came and made 31 saves in Game 4. "I've been sort of letting him do his thing the first three series," Allen said. "Hitch told me to go get 'em. It's my chance now." Allen started all six games in the Blues' first-round loss to Minnesota last spring. He learned from that experience not to think he had to be extra special. "I think I came in last year a little bit antsy," Allen said. "I think this year we just realize it's honestly another hockey game. Be yourself, play your game, what we've done all year will bring success." The Blues ended a scoreless drought of 156:59 with two first-period goals and poured it on in Game 4, easing any pressure Allen might have been feeling. The scoring matched their high for the playoffs in a 6-1 Game 7 victory at Dallas. "We knew we had so much more in us to give," Allen said. "If it was the other way around, and we were playing phenomenal and we still weren't finding ways to win, then maybe that's another story." Backes didn't play the final two periods on Saturday night. Fabbri had just two shifts in the third period after getting shaken up on a hit by Tommy Wingels. Forward Paul Stastny was entering the ice just after Fabbri was hit and didn't see it, but didn't think Blues players were too riled about it. "I mean playoff time, you know you're always going to get hit when you have the puck or when you move the puck, a second or two after," Stastny said. "That's just how it is - we do the same thing to them, they do the same thing to us." Before they stumbled in an opportunity to seize control of the series, the Sharks had been dominant. DeBoer anticipates a highly motivated roster for Game 5. "You know, missed opportunity," DeBoer said. "They want to make it right." Martin Jones is the franchise's first goalie to post consecutive playoff shutouts. He struggled under the Blues' pressure and was lifted for the first time in the postseason after allowing four goals on 19 shots in Game 4. "They scored a couple goals," Jones said. "You don't like it, but you move on. You get ready for the next one." Forward Logan Couture said when the Sharks have had setbacks this season they've always found a way to "push back." "We know in our room we didn't play well at all," Couture said. "We made a lot of mistakes that we haven't been making throughout these playoffs, but Game 5 is a new opportunity for us."